Drinking champagne became very fashionable throughout Europe in the 19th century. In England, as elsewhere, it was very expensive, but its sheer inaccessibility to most created a mystique around the drink. 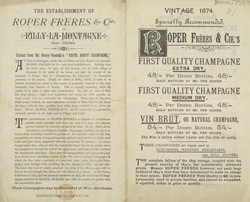 As a result, music hall stars would regale their largely working class audiences with songs about champagne, the most famous of which, George Leybourne's 'Champagne Charlie', is remembered to this day.